Sometimes, half an inch makes all the difference. But that's not the only reason to step up to the 735X. Its powerful 10,000 rpm motor will handle anything you feed it--oak, walnut, exotics--with absolute ease. The three-knife cutterhead will make 96 or 179 cuts per inch, depending on which speed setting you choose. Mess is minimized with the fan-assisted chip ejection, which literally vacuums chips off the cutter-head and blows them out the exhaust. The 735X's automatic carriage lock will save you from snipe by reducing the movement that causes it--what a great idea. We also love the redesigned thickness scale--it's big and super-visible, even in poor lighting. Those who do repetitive cuts will appreciate the turret depth-stop; set your most-used cuts to it once and you're always assured of accuracy. The home woodworker will be thrilled, and the professional's expectations will be more than met. Includes: dust hose adapter and dust ejection chute. When our planer arrived, it felt "stuck" and the raising and lowering hand crank would not turn. Not wanting to force the unit, we took it apart and didn't find any specific issues. At that time, I decided to force the unit and it ended up just needing movement and loosening of the original mechanism. Grizzly was great about providing information about the warranty and what we could/could not do to the unit that might affect the warranty. As most of you reading this, I did a fair amount of research, and am very pleased. Most all the review I read/watched were spot on. Did have some slight damage to the base of the planer from shipping, but extremely minor. The box is heavy (100lbs) and I'm guessing the somewhere along the line it took a hit on the corner. Out of the box the quality was awesome, then I felt the need to adjust the included infeed/outfeed tables as recommend by many other on-line. The thinking was to eliminate snipe - even thou a had none - dumb. Should have left it alone, but have things back. The installed blades were great also until I ran a pine board through with a knot that must have let go and put a slight knick in a blade. Opened it up and shifted one of the blades and all is good again. Have filled/plugged my shop vac several times and will be looking into some type of chip collector soon. Having the blower on the planer does give me the option to shoot it outside in the future, but with 3ft of snow and sub zero temps, I will be collecting chips for a couple more months yet. The dust collection port is centered on the top part of the planer which is odd placement. Boards have the potential to get snagged on the hose as they exit the planer. The Grizzly planer I've been using for years had the dust collection port on the side which was never in the way. I also prefer the various gauge markings on the Grizzly planer to this one. I wish I got the Grizzly planer instead. Great purchase. The free stand went together easily. Planer works great. excellent planer - easy setup, easy to change blades, and quiet. Planer is working great. I am pleased with this purchase and glad I made it. Love just about every aspec of the planer but the hand wheel for height adjustment initially took both hands and a considerable amount of force to turn. Copious amounts of blaster dry lube have made it easier but it still takes both hands on occasion. Not sure if this is normal but I dont feel like it should be so hard to turn out of the box thus the 4 stars. I purchased this item online from the Grizzly website. Shipping was fast and the planer arrived in great shape. The free Dewalt planer stand made this a no-brainer purchase. Big foot print and very stable. Happy with my purchase. Very good planer. Worked just as I needed it to on some old barn wood. Ordering from Grizzly was very easy and convenient. I'll definitely order from this company again. I bought to retire my older planer, this thing makes no snipe! Grizzly is great to work with. No problem with the shipping. No problem with the planer. I agree with others as to the quality and features of this fine planer. Powerful, precise, and great usability. Well designed controls to precisely dial in desired thickness, and 2 speeds allowing for slower pass on final cut to produce excellent finish. Built in fan aids greatly in chip collection. My unit came with a second set of blades. Unlike one reviewer, I've found the initial set of blades to be quite durable, holding up through many hours dimensioning quarter sawn oak which is typically hard on blades. ....the response of Dewalt's customer service department to this incident was a breath of fresh air. Without the least hassle, they immediately shipped me a replacement part under the unit's 3 year warranty. Great machine, great customer service, and glad to be able to purchase down the street at the Bellingham Grizzly showroom, which also has provided me with outstanding customer service. I'm so glade i bought it. Only thing i'm not happy about is my credit card got compromised. and i had to change my card and report the incident to the police. Customer service at Grizzly was great. The planer arrived within 5 days. Setup was not difficult and factory adjustments were on the money. I planed walnut boards and the finish was better than expected. This is a great tool. This thing is a beast love the two speed feed. The built in blower is a great feature also don't even need to use my vacuum. Love the package deal too. Can't go wrong with this planner. Good planer - does a great job. The only negative is the quality of the blades. The blades provided will not last very long if you are a serious user and often plane hardwoods. I will need to upgrade to the byrd insert cutter in the near future. Very happy with the product. As far as a Grizzly is concerned I decided to pay $50 more for this item than I would have at Amazon because I wanted to buy from a Grizzly. I bought this item a few weeks ago. 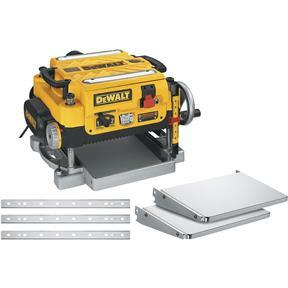 It is a marvelous planer with mobile stand, with infeed outfeed table and extra knives.